The Jags are coming off of one of their best seasons as a franchise after losing to the G.O.A.T. in the AFC ‘ship, and now their offseason has begun. Over the past week, there have been a couple of developments at the QB position in the NFL. Blake Bortles had surgery on his throwing wrist, and the trade and signing of Alex Smith to Washington all but signals the end of the Kirk Cousins era for the ‘skins. There has been some buzz on Twitter about the possibility of Jacksonville being a landing spot for Cousins. For that to happen, Jacksonville would need to clear some cap space before March 14th. Cutting Bortles would clear up roughly $19 million. Bortles would need to be able to pass a physical before the March 14th deadline for this to happen. So what injury did Bortles have and how quickly will he be able to recover? Are the Jags even planning on moving on at this point after coming off of one of the best seasons in franchise history? Reports are that Bortles played the entire 2017 season with a tear in his wrist that was managed with injections to limit inflammation and pain. Considering the demands of the QB position with taking snaps, throwing the football, and handling the ball on nearly every offensive play, his right wrist is extremely important. 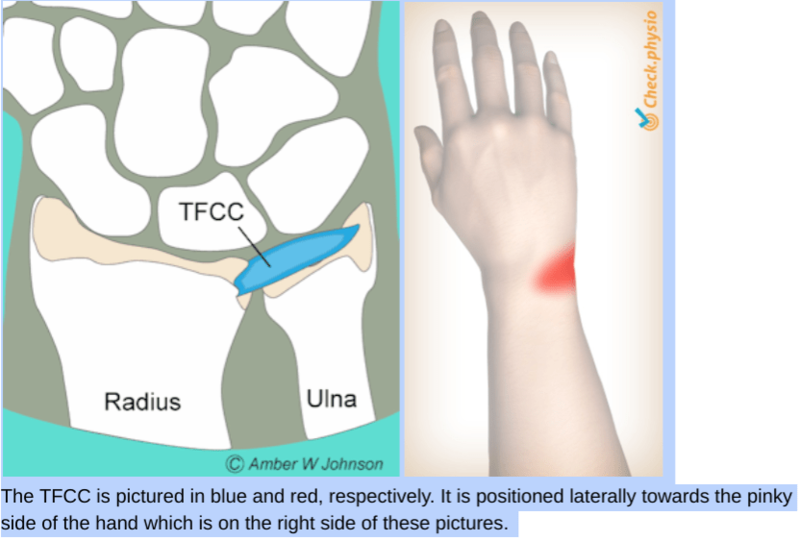 Odds are that the tissue that was torn was the TFCC or the triangular fibrocartilage complex. This tissue serves as the shock absorber for the wrist and also helps to stabilize the joint. The TFCC is pictured in blue and red, respectively. It is positioned laterally towards the pinky side of the hand which is on the right side of these pictures. The practitioner is compressing his wrist and bending the patient’s hand towards their pinky. Pain is indicative of a positive test. Reports indicate that he should be able to recover in a few weeks meaning that they likely went in and trimmed off the damaged tissue versus repairing it. This is similar to the difference in recovery for an injury to the meniscus of the knee when surgically repaired with a meniscectomy (removal) vs. a meniscal repair (sewing together). If all goes as planned with his recovery and rehabilitation, Bortles should be able to pass his physical by March 14th. Now, do the Jags move on from a guy they are heavily invested in? Remember they spent the 3rd overall pick on him in 2014. His expected salary for 2018 will be about the league average for a starter, and he just helped take them to the AFC championship. Bortles is still relatively young in QB years being 25 years old. Critics will say that the Jags made it as far as they did in spite of Bortles, I think he played with an injured throwing wrist all year long that affected his play. I’m predicting that he enters 2018 healthy and as the Jags starting QB primed for a bounce-back year. Eric is a Doctor of Physical Therapy specializing in the rehabilitation of sports medicine and orthopedic related injuries/surgeries. He has a passion for all things sports related. For more information about Eric, please visit any of his listed social media accounts or websites.